On April 28, the Angels surprised the baseball world by calling up Mike Trout. A consensus top-three prospect, Trout was considered a future star. But he was just 20 years old, and had struggled at the plate in a 40-game big league cameo last year. The Angels appeared to have too many players vying for playing time in the outfield and at DH, leaving some to wonder how much Trout might play, let alone whether or not he’d succeed. In fact, he did succeed, and is on his way to one of the best rookie seasons of all time, maybe even an MVP trophy. Also on April 28, the Nationals stunned the baseball world by calling up Bryce Harper. Another consensus top-three prospect, Harper was also considered a future star. But he was just 19 years old, and had played just 58 games above A-ball, making his call-up a much bigger curveball than Trout’s. He mashed big league pitching for a while, then fell into a deep slump, one where he has failed to hit his weight over the past two months. Still, he’s been an upgrade for a Nats team that lacked outfield talent for most of the year, with injuries compounding the problem. On August 9, the Orioles shocked the baseball world by calling up Manny Machado. Also one of the top prospects in baseball, Machado was considered a future star. But he was just 20 years old, with 109 games at Double-A (in which he hit a fairly modest .266/.352/.438) and no games above that. He cranked three home runs, a triple, and a double in his first four major league games before falling into a mini-slump that saw him go 4-for-24 with one walk in seven games. Still, he’s been an upgrade for an Orioles team that had Edward Scissorhands playing third base. As this season hits the home stretch, several other contending teams have elite prospects toiling in the minors. Some of those farmhands fit the Harper/Machado mold, with little to no experience in the high minors but enough talent to potentially make an impact now, such that more surprise call-ups could be in order. Their arrival could add to what might one day go down as one of the best rookie classes of all time. If those call-ups are going to happen, it will likely be soon. To become eligible for the postseason, players must get called up before the September 1 roster expansion date (or, much less commonly, have their team pull a bit of roster shenanigans). With all that in mind, here are three dynamic, young talents who could find their way to the Show in the very near future. For 29 years, Vince Coleman held the record for most stolen bases by a minor league player in a single season. Hamilton smashed that record Tuesday night. The 21-year-old shortstop swiped his 146th base of the season in his 120th game. He’s put up strong offensive numbers, too, hitting .318/.415/.435 in the minors this year. There are holes in Hamilton’s game. He has hit just seven homers in 367 career minor league games. That lack of power could prompt big league pitchers to attack him more aggressively, in an effort to limit his walks and his times on base. He also has even less experience above Single-A than Machado, with just 38 games at Double-A Pensacola. ESPN’s Kiley McDaniel scouted Hamilton and broke down other weaknesses, including a tendency to chase fastballs well out of the strike zone. Even his vaunted base-stealing ability might be in question, with Hamilton making up for bad jumps with raw, blazing speed, knowing minor league pitchers and catchers might not be experts in managing the running game; he’ll almost certainly swipe his share of bags in the majors, but his success rate (81.6 percent this year in the minors) might not be as high. Still, Hamilton would seem likely to impact a pennant race this season, even if he’s used in little more than pinch-running situations. The dynastic A’s of the early-to-mid-70s found a way to keep Herb Washington on the roster, with Washington appearing in 105 games across two seasons, never once picking up a bat. Even as a raw would-be rookie with minimal minor league experience, Hamilton projects as a much better player than Washington, who might have been the most one-dimensional player in the sport’s history. Dusty Baker loves speed (see also: Willy Taveras’s plate appearances as a terrible leadoff hitter for the Reds in 2009), and teams can and often do carry one fewer pitcher in the playoffs thanks to more frequent days off. If Hamilton does get the call, get ready for some serious excitement, even if he does little more than run the bases. No need for wild speculation here: Rangers general manager Jon Daniels himself acknowledged that calling up Profar is a “consideration.” Just 19 years old, Profar has already established himself as one of the most polished prospects around. The youngest player in the Double-A Texas League at the start of the season, Profar has shown power and patience, whacking 46 extra-base hits and racking up 59 walks in 529 plate appearances. He’s stolen 15 bases in 19 tries, and shown enough glove to keep Texas interested in making him the team’s future shortstop. Elvis Andrus holds that position for now, and fellow All-Stars Adrian Beltre and Ian Kinsler aren’t moving off third or second base either. So unless the Rangers think that a .269/.302/.349 hitter with no defensive ability doesn’t warrant an everyday job — even if he has more leadership skills than a thousand General Pattons — Profar would serve as a reserve if the Rangers called him up. Mike Olt fortified the Rangers bench, and Mike Napoli’s pending return would push Geovany Soto there, too, adding a little more pop. But assuming Ron Washington isn’t planning to carry 13 pitchers in October, there’ll likely be room for one more helper off the pine. With a diverse skill set, the ability to play multiple infield positions, and sheer talent, Profar would make a ton of sense as that guy. to say nothing of being thrust into the middle of a hellacious playoff race the summer after prom. For those who have missed it, Bundy is the 19-year-old phenom who has taken the lower levels of the minor leagues by storm. The fourth overall pick in the 2011 draft had a 0.00 ERA in eight starts for low Class A Delmarva, and while he was more of a mortal at high Class A Frederick, he was bumped up to Double-A Bowie with a 1.92 ERA and 103 strikeouts in 84 1/3 total innings this season. His fastball sits in the mid-to-upper 90s and both his curveball and changeup are advanced, and for much of the season he hasn’t been allowed to throw his low 90s cutter, which many believe is his best pitch. For many, Bundy is the best pitching prospect in baseball. He might be one of the best young pitchers I’ve seen in quite a while. He’s got so much upside to him. He looks like a great pitcher. He’s got a great arm, and it’s fun. It’s fun going down there seeing him. He’s obviously got a big, bright career ahead of him. Should the Orioles call up Dylan Bundy? 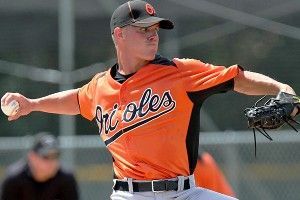 Maybe the better question should be, how can the Orioles not call up Dylan Bundy?